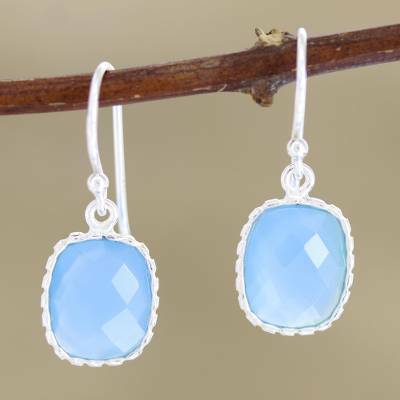 Blue Chalcedony Dangle Earrings in Polished 925 Silver, "Delhi Sky"
Celestial blue gemstones featuring a checkerboard facet distinguish these dangle earrings from Bhavesh in India. The blue chalcedony gems, which total five glorious carats, are set in sterling silver with a scalloped edge. They swing from silver hooks. You can find chalcedony dangle earrings 'Delhi Sky' by Bhavesh in jewelry categories such as Chalcedony Earrings, Silver Earrings, Sterling Silver Earrings and Dangle Earrings. Enjoy exploring these sections for other Novica treasures. Bhavesh is a highly-skilled jewelry artisan. In his workshop, he employs several artisans on a full-time basis and others on a part-time basis. Bhavesh is a dedicated father who works very hard to provide for his two children. "Beautiful and delicate - a great gift idea"
The stones are a luminous blue. The style is classic and versatile. A month after I bought these, I saw similar earrings featured in Vogue magazine. I bought these for my mom and still admire them every time she wears them! Sweet, classic style earring. Smaller than expected, but good. Color darker than show, I like them better. Wish they were larger. I love these earrings and the shade of blue! Simple lines, beautiful color of blue chalcedony, Great design, like them. These earrings are beautiful. The blue is so interesting - not too light, not too dark. The size is just right. I don’t love BIG earrings but these aren’t tiny either. They came in a lovely little gift pouch too! Look much more expensive than the price. Perfectly matched color and interesting cut. Nice size, not too large or too small. i had made a necklace of Calcedony and Aquamarine. These earrings just set it off. Delhi Sky earrings are nothing special. They are true to the photo. I should have returned them, since they have not been worn. Just too plain for me I guess. Very nice earrings, but I wish they were a bit bigger. The color is not as bright as shown in the picture. I gave the necklace as a Christmas gift and it was lovely. I decide to buy the earrings to match. They are as pictured, light blue stones and well made silver bezel. These look exactly as they do in the photo. I love wearing them! "Mother in law loved them!" Not only where these prompt and just as pretty in person, my mother in law absolutely loved them. The necklace is simply gorgeous. Classy and Elegant. I love it. Thank you.